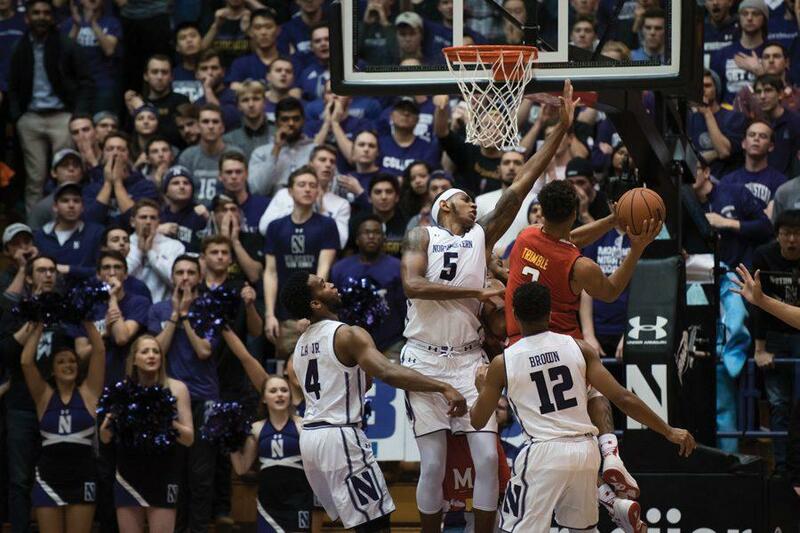 Melo Trimble drives into the paint. The junior guard lit up the Cats for a career-high 32 points. Maryland guard Melo Trimble hadn’t played well his last three games. So he got a haircut. With the weight off his head, Trimble sliced through the Northwestern (19-7, 8-5 Big Ten) defense all game long Wednesday night, racking up 32 points — including 19 in the second half — on 12-of-17 shooting in a 74-64 win for No. 23 Maryland (22-4, 10-3). “The back of my head had some wind to it,” he said afterwards, grinning. After scoring just 3 points through the first 10 minutes, Trimble abruptly shifted into an unstoppable mode — unstoppable on the perimeter, unstoppable at the rim and unstoppable everywhere in between, too. The Terrapins’ leading scorer this season went 4-for-5 from deep, drew four shooting fouls — and still made the shot on three of them — and even pulled down four rebounds. Wildcats sophomore forward Vic Law, exhausted from guarding Wisconsin’s Bronson Koenig for 30 minutes on Sunday, never stood a chance of keeping up. In the paint, sophomore center Dererk Pardon was clearly outmatched by Trimble’s athleticism. And when senior forward Sanjay Lumpkin was shifted onto Trimble in a desperate attempt to slow him down, Trimble ended the experiment immediately by swishing a 3 over Lumpkin. Trimble had struggled in his last three outings, shooting 11-for-39 from the field and 2-for-14 from deep as the Terrapins suffered two losses in that span. But that trend changed quickly in Evanston. “When I saw that first shot go in, I knew, right then and there, tonight was going to be my game,” he said. The 6-foot-3 guard gave the Terrapins a big advantage early by draining a triple, getting two layups and then blocking NU freshman guard Isiah Brown to set up a Damonte Dodd bucket and stretch the visitors’ lead from 13-9 to 22-11 in a two-minute span. He somehow was even better after halftime, employing his impeccable ball-handling skills and elusive shake moves to rip through the core of the Cats’ defense time and time again. Ultimately, it all added up to a career-high scoring performance for Trimble and a ship-righting win for Maryland.